Each year the KVIS selects one commercial property owner to receive The Most Improved Property Award. The first recipient of the Award was Ron Alsheimer, owner of Plaza Group. Mr. Alsheimer has owned commercial property in Kenmore for many years but he is the first developer to create the Delaware Avenue style that you see in the Village. Plaza Group works to have their properties to visually fit well into communities so when the building was purchased next to St. Paul’s church on Delaware Avenue, they set about improving the three retail spaces there in this way. Each space was painted a different color from an earth toned palette, windows and doors were replaced, awnings were added above the windows, new signage was anchored, while accent lighting was placed for style and security. The total effect of these improvements created a modern but quaint vision that is widely applauded by one and all. This Delaware Village look became the unofficial style blueprint for this commercial part of Kenmore with other developers like Sinatra Realty embracing it and following suit when they purchased properties nearby. 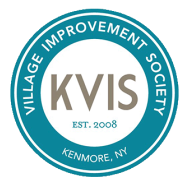 The KVIS gave Ron Alsheimer the Most Improved Commercial Property Award, a stylish crystal engraved award, at a meeting of the Society where we thanked him for the quality, design, and care he places in his property designs here in Kenmore. We are grateful to Mr. Alsheimer for his investment in Kenmore and hope that Plaza Group will continue to purchase and improve properties here for many years to come. The second winner of the award was Paul Iskalo of Iskalo Development Corporation. Iskalo Development Corporation is the owner of many area distinctive properties including the Buffalo Electric Tower building. The former Kane Doyle Jeep land at 2780 Delaware Avenue was purchased by Iskalo who constructed at 21,000 square foot brick two story mixed-use structure there. The building tenancy now includes physicians offices on the 2nd floor and Benson’s Surgical Supply and a Catholic Health Laboratory Patient Service Center. The skilled use of bricks, traditional signage and lighting on the exterior of the building are further enhanced by the beautiful interior that is spacious and comfortable. Attention to detail in all aspects of the design was clearly a high priority; the plush carpeted open stairwell of the building even includes a stunning oil painting of Delaware Avenue in the Village commissioned by Paul Iskalo. The KVIS thanks Paul Iskalo for the vision he has expressed in the development and for the quality and care put into the building and design of the structure and tenancy selection. This is the first major commercial development in Kenmore in many years and we are grateful to Mr. Iskalo for pioneering future development here. Iskalo Development is actively seeking quality retail tenants for the space remaining in the new building as well as the vacant lot across the street which they are offering on a build to suit basis.